What is something that you currently do that seems to come natural for you? It’s most likely because you’ve done it so many times, that you’ve mastered it. This is the result of doing something repeatedly. 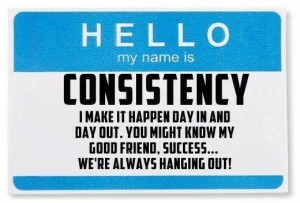 Being consistent has plenty of benefits associated with it, but for this article we’ll only focus on two. The first benefit is that you’ll get better at whatever it is you’re doing. If you want to perfect a sport, skill or even a new job, nothing ensures your success more than just repeatedly doing it. Of course it’ll take time for you to master it, but in due time you will acquire what it is you desire. One example that really stands out to me is Michael Jordan. It’s hard to imagine that someone who is universally regarded as the greatest player of all time got cut from his high school varsity team in his sophomore year, but that was the case. He just decided to spend more time playing basketball and improving on his craft. He practiced and trained every single day. There are other factors that led to his success including perseverance and a strong work ethic but the key thing that really helped him improve is that he was repeatedly playing. There’s definitely a strong correlation between a persons skill level and the amount of they time spent working on those skills. Another key benefit of being consistent is that you’ll eventually get to reap the fruits of your labour. Let’s say you were interested in going to the gym to get your dream body. Perhaps you want to get bigger, more toned or lose weight. It certainly won’t happen the first day, week or month. In some cases it may not happen until your first year. Rather than giving up on yourself or your goals, you just keep going. Eventually, you’ll see your efforts lead to direct results. Suppose you’re interested in starting up your own website or blog; you won’t achieve much traffic if you post once in a blue moon. The person who posts content consistently is more likely to see more traffic or stronger results. So this leads to the important question I’m sure you’re wondering: what can I do to be more consistent? The answer is relatively simple: just go out there and do it as often as you can, as much as possible. Allocate a set time each day for when you want to do something. For example, if you have free time from 7 pm to 9 pm then dedicate those 2 hours to focusing on what it is you’re interested in doing. Do this for a few days on a weekly basis repeatedly. Don’t get discouraged if things are difficult at first or not going the way you want it to. Remember, the more you do it, the more better at it you’ll become and eventually you’ll accomplish your goals. If you enjoyed this article, be sure to leave a comment below with your thoughts. Also, be sure to follow me on my social networks!